I travel. I eat. I watch movies. I read. I LOVE. I LIVE. And then I whine in between. I never saw the first movie in full. I saw bits and pieces of it. The humor didn’t appeal to me that much that I would totally forget about the remote control whenever I chance upon a rerun of it on TV. But I wanted to watch this one. No, scratch that. I wanted to watch a movie this weekend. I wanted to go out. I wanted to celebrate Rafa’s seventh win in the French Open. And so I dragged my best movie buddy ever to see it with me. The movie didn’t disappoint. We love Uge. Isa s’ya sa kakaunting dahilan para mapapanood mo kami ng Pinoy movie. The other two reasons being John Lloyd Cruz and Sarah Geronimo. Take note, dapat package deal sila. Kung hindi sila magkasama, ayawan na. Anyway, back to “Kimmy Dora and the the Temple of Kyeme”. I’ll just list down some random thoughts about it. Tinatamad na akong maging intelektwal. Chos! Ang ganda-ganda-ganda-ganda ng bahay nila Kimmy at Dora sa movie! I recognized the door. I know it’s by Mr. Agi Pagkatipunan, the wood wizard from Rizal who makes exquisite masterpieces for the stars. I’ve learned about him when I was still working with Timberland Heights. We featured his works. Amazing house! I even thought it’s Dingdong Dantes’ house, but I’m not too sure. Speaking of Dingdong, bakit s’ya may malaking mole sa noo? Masyadong mabilis ang pangyayari sa South Korea, hindi ko na-appreciate ang mga frame. Hindi pala namin kayang umubos ng Taters popcorn na Jumbo. Magaling ang makeup ni Alodia Gosiengfiao. Is-creepy slight! Sabi ni best movie buddy ever, mas maganda daw ‘yung first movie. I trust his verdict. The movie is funny in the right places. Notice that I haven’t used the word “hilarious” until this point to describe it. Never will. It’s funny in the right places,but not that hilarious. Hindi naman ako naiyak like in other hilarious movies like “Here Comes the Bride”. Pero nakakatawang tunay ang manong sa bandang likuran. Tapos na ‘yung scene, tumatawa pa rin s’ya nang malakas. Ang dami lang n’yang tawa. Overall, I enjoyed the movie. Pero kailangan ba talaga may “That’s it, Pusit” sa dulo? Okay na, eh. Tsk. 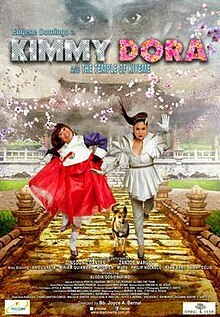 This entry was posted in Spud Times and tagged Agi Pagkatipunan, Dingdong Dantes, Eugene Domingo, Kimmy Dora 2, Kimmy Dora and the Temple of Kiyeme, pinoy comedy, pinoy movies, Uge, wood wizard. Bookmark the permalink.